Whether for an adult or baby, many reach for ibuprofen — brand names Motrin and Advil — to cure fever, pain and other ills. But is this commonly used over the counter drug healthy? So many studies have said no, and even the FDA has issued warnings. An estimated 16,000 people die per year from NSAID use, and another 100,000 are hospitalized. Yet, we reach for the drug when worried about illness. Let’s unpack why this is not a drug that should be in your medicine cabinet. Ibuprofen is a non-steroidal anti-inflammatory drug (NSAID) which is sold both over the counter and as prescription. NSAIDs block the production of prostaglandins, which our bodies release in response to injury or inflammation. We feel these prostaglandins when we feel pain. Note that drugs made from acetaminophen, like Tylenol, Robitussin, and Nyquil, are not covered here but do carry their own risks. Increase heart attack and stroke risk. Back in 2005, the FDA issued a warning connecting ibuprofen and heart attack an stroke risk. But in 2015, they released an even more serious warning. The risk goes up for taking ibuprofen often, and for longer periods of time. Note that this is not aspirin, as that is often taken to curb heart attacks and stroke. Tinnitus. Tinnitus is a constant ringing in your ears, an annoying side effect of too much ibuprofen. For some, tinnitus pushes them to anxiety, depression or even suicide. Stomach inflammation, ulcers, and intestinal bleeding. This is right on the package, and is a scary side effect, especially for those already suffering from leaky gut. pain-relievers-raise-blood-pressure”>High blood pressure. Also a linked side effect that most dealing with inflammation already struggle with. Taking ibuprofen during the third trimester of pregnancy can result in harm to the baby. Play it safe though, and do not take it all during pregnancy. It is also not known if ibuprofen passes through breast milk, so also do not take when nursing. Liver damage. NSAIDs are known to damage the liver, especially with constant use. In fact, it is believed to be one of the top causes of liver damage. Diabetes. There are links to diabetes from extended ibuprofen use. Ibuprofen use depletes glutathione. Glutathione is an antioxidant that detoxifies in the body and regulates the immune system. Low levels are dangerous during illness, especially after vaccination. Nearly every autoimmune condition has been linked to low glutathione levels. Instead, try these natural pain and symptom relievers. 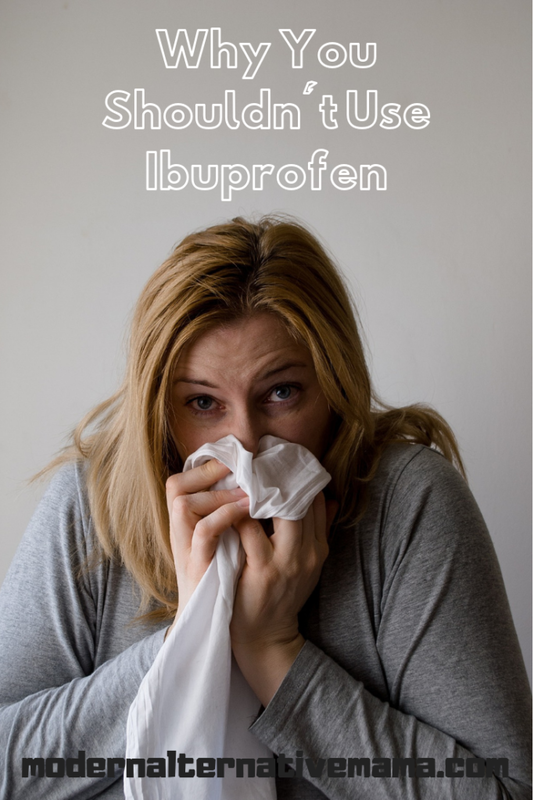 You do not need ibuprofen to relieve aches, pains, and fevers. There are natural remedies which will actually solve the symptoms, not just cover them up. Red raspberry tea frequently to encourage a healthy uterus. A heating pad or castor oil pack on the uterus. Try doing a juice cleanse before your next cycle starts to rid the body of toxins. Ibuprofen is taken daily around the world, but people are also checking into the hospital with terrible ibuprofen side effects. There are much better, natural ways to take care of aches and pains. Try a natural remedy instead next time, and toss the ibuprofen out today. 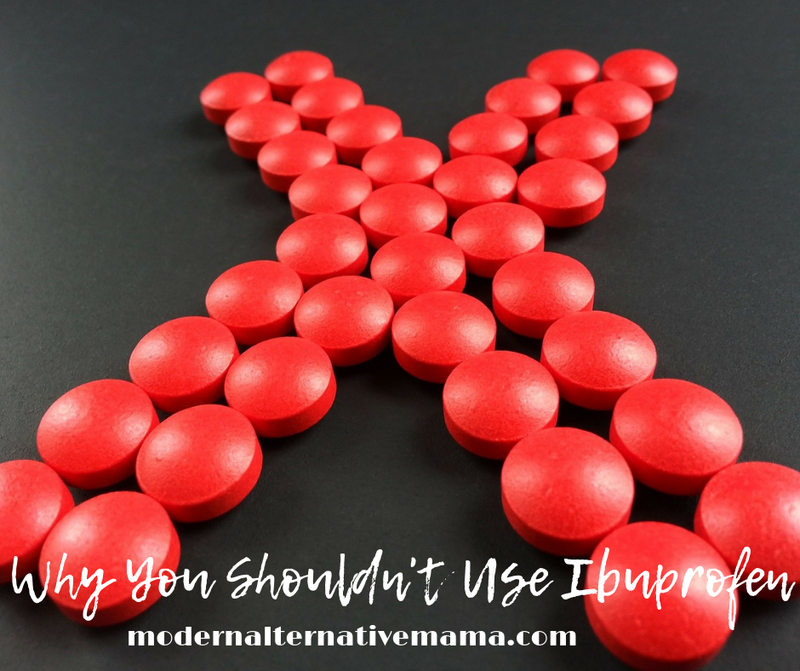 Do you use ibuprofen? Tell us why or why not. I admit, this crunchy mama does use ibuprofen on a semi regular basis. I get migraines a couple times a month, and ibuprofen (or Tylenol, if I must) knocks it back well enough that I don’t have to resort to rescue meds. I’ve always assumed that was choosing the lesser of 2 evils, but I can’t honestly say I’ve researched it. I’m just glad that natural lifestyle choices and diet have taken me from 1-2 migraines a week, to 1-2 a month! I knew acetaminophen depleted glutathione but I was unaware ibuprofen did as well! Thank you!